Caravaggio. Siracusa - Benvenuti su tourguideinsicily! On May 28, 1606 a duel to the death, forced Michelangeli Merisi to flee from Rome where he never return. He killed Ranuccio Tomassoni, difficult to clarify the real reason for the dispute, perhaps the real reason was a story about women. Caravaggio is accused of his assassination and the arrival of the arrest warrant is hidden in the fieft of Marzio Colonna trusting in the pardon of the Pope. Began for Caravaggio some years spent between Naples, Malta and Sicily. Here he arrived in October 1608, from Malta, afther a serius dispute with a knigth of justice. His condition continues to be that of fugitive, which is why we find him in a continuous wander between the various cities of the island in search of a safe haven. 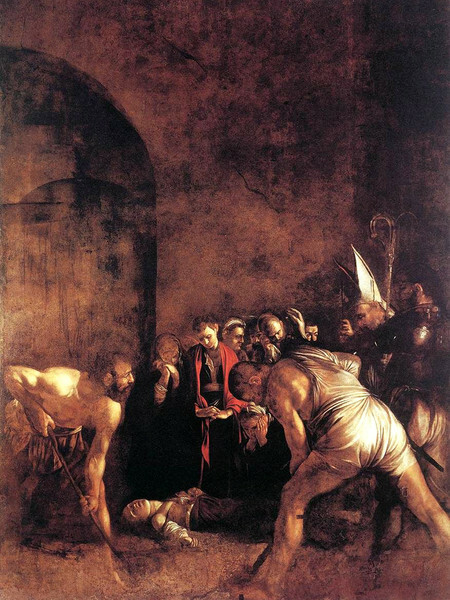 To witness its passage are very important works: the Burial of Saint Lucia is the first Sicilian work of Caravaggio, the painting was commissioneted by the city senate on the intercession of Mario Minniti (painter), his friend, on the occasion of the restoration of the Church of Saint Lucia, where it was probably placed December 13 1608, the day when the Saint, patron Saint of Siracuse is celebrated. The paint (cm 400 X cm 300) was carried out on a support consisting of fourhemp cloths sewn vertically; above the plaster preparation the painter had laid out a reddish-brown matrix which is left exposed to assume both hte classic function and the "half tone" funcition for the figures. This technical expedient, alreadyused in Maltese period, allows Caravaggio very short executiontimes, considering that the work is completed in just two months. The palette, in shades of red and brown, is composed of ted ocher, lacquer and cinnabar red, bound to linseed oio. Caravaggio does not portray, as was generally used, the time of Lucia's martyrdom:it presents, instead, the burial. The viewer's point of view is at ground level, where the body of the Saint is placed, as if the spectator partecipated in the tragic event. Everything is suspended, slow: the group of characters on the right attends the scene, but is on the left the fulcrum of the composition, where the two huge figures of the burialist, slowy, dig the grave. The painful event takes in the lower part and characters are dominated by an immense empty space, perhaps a reference to the catacombs or the most important latomia of the city, called by Caravaggio the Ear of Dionysus.